Nearly six years ago, Marvel made one of the bigger decisions of the decade. They ended the run of their popular Ultimate Spider-Man with the controversial Death of Spider-Man storyline, which ended the story of the Ultimate imprint’s Peter Parker. 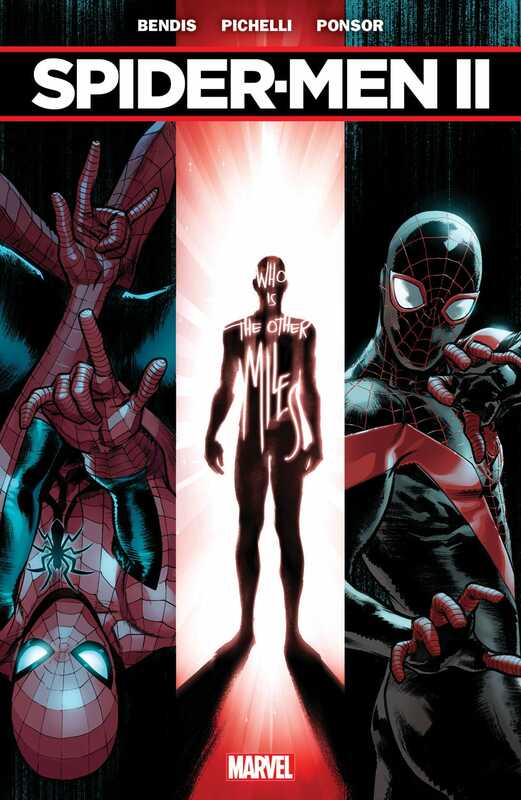 In the aftermath of that, Miles Morales was introduced as the new Ultimate Spider-Man. For what it was, Miles was genuinely refreshing as a character. While the premise of a bi-racial Spider-Man taking on Peter Parker’s legacy isn’t necessarily new (Miguel O’Hara did that first), the execution was a nice extension of the overall modernization that Bendis had made of the Spider-Man mythos over the years. That changed recently with the ending of Secret Wars where Miles was transplanted from the destroyed Ultimate Universe to the regular Marvel Universe, and since then has been operating as Spider-Man alongside Peter Parker and Miguel O’Hara. That last part in particular is a big part of what happens here. Spider-Men II is a fairly direct sequel to the original, even down to the cover asking the question about the other Miles Morales. While that question is (kind of) answered, it also deals more directly with the inciting incident/plot device from the original series: the return of the dimensional rift between Earth-616 and Earth-1610 that first allowed Peter and Miles to meet. As far as Peter and Miles, both are written well. It’s not as if Bendis hasn’t had an ear for the MU Peter Parker and Miles is a character he created, both play well off of each other. But it dives into one of the primary problems with Miles Morales in the main Marvel Universe: he’s never quite allowed to be his own man. While the issue does delve into the complications of multiple Spider-Men running about, it doesn’t resolve the long-running issue that results from Miles being transposed from a world where he was the one and only Spider-Man, to one where he’s always going to play second banana to a Peter Parker, who’s in his prime. Even with animation and the upcoming movie, there’s always going to be a layer of worry that what happened with Sam Wilson being booted from the role of Captain America could happen to him, so for that purpose it’s a shame that Miles isn’t THE Spider-Man. While Marvel has attempted to rebuild its comics brand around the concept of diversity, it has largely failed to respect that with regard to its creative minds and with the ejection of characters like Sam Wilson back into the B-List. While Miles is obviously an exception to that rule, it’s not hard to feel like more couldn’t be done to establish him on a different rail from Peter, in order to avoid that same fate. Considering it’s been five years since the original Spider-Men series, it seems a bit late in the game to follow up on an old cliffhanger by introducing another Miles, or for that matter dredging up the fact “our” Miles was from somewhere else. That being said, the book is a candy store of beautiful art. Sara Pichelli – one of Miles’ co-creators – returns to draw this story, and if there’s nothing else that can be said: it is gorgeous. There’s plenty of effort made to distinguish that Miles has grown older since he first showed up as a scrawny kid Spider-Man, but he’s still got a very different physicality from a grown man like Peter. There’s also a lot of bizarre stuff that happens in this issue. From the appearance of the Armadillo to our first glimpse at something from beyond the rift, Pichelli draws it all here. Ponsor’s colors also do a great deal to keep the book very vibrant and distinguish it from the rest of the current Marvel line. At this time, however, it’s quite a difficult book to say I’d recommend. While the art is fantastic, it feels like so much of the rest of what’s been hurting Marvel lately in execution.